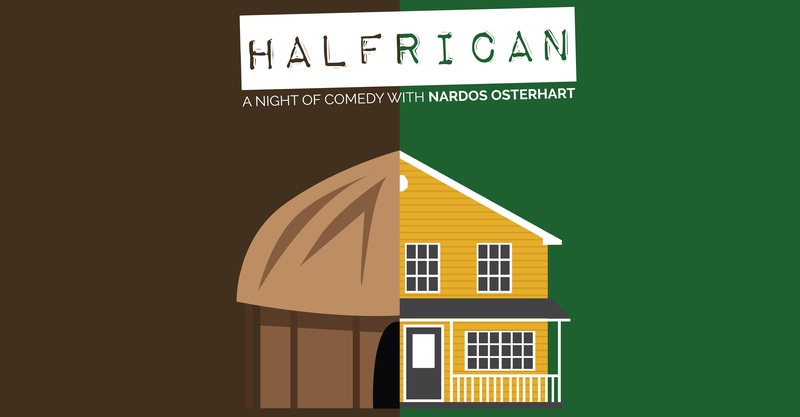 One of Michigan’s most promising young comedians, Grand Rapids’ Nardos Osterhart has decided to take her story from the comedy club stage into the theater circuit as she debuts her one-woman show “Halfrican” at the Koning Micro-Cinema Theater on February 20th. Having won GR’s “Funniest Person in Grand Rapids” award back in 2013, Osterhart will perform two sets at the former Wealthy Theater that Saturday evening detailing her life balancing the two worlds in which she has lived. It should prove to be one of the most entertaining things you can see in the state of Michigan that weekend, and we are very excited to have comedian Nardos Osterhart as our guest today in our Artist Profile series. RM: Your family moved to America when you were five years old…How much of life on that continent do you remember from the time leading up to when you arrived here? NO: Not much to be honest. Africa was a blur and we moved around a bit before moving to Germany. I was born in Nigeria, we fled to Zambia, and then my father made arrangements for us to leave the continent. 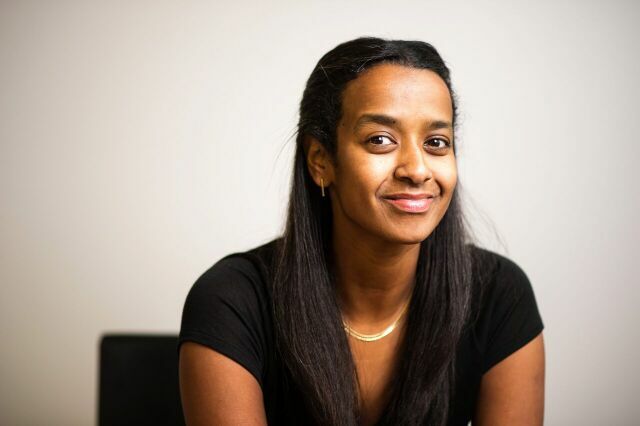 Europe could have been a permanent option but our time there felt uncertain and the U.S. had open arms for refugees fleeing the Ethiopian famine and political crisis at the time. RM: For those of our readers who may not be familiar with your work, when and where did you first start doing comedy? What was so intriguing about the art form that made you want to keep getting on stage and doing it? NO: My first time on stage was Halloween, 2011. I was at the Riverfront Hotel in Grand Rapids, Michigan doing a Sunday night show called Sunday Night Funnies. I had a fear of public speaking and it was becoming a requirement of my job through a recent promotion. I couldn’t shake the anxiety I felt preparing to talk in front of colleagues and was wanting to get over it as quickly as possible. The toastmaster and Dale Carnegie public speaking classes were only available during the day and I worked full time while attending grad school in the evenings/online. My husband and I were fans of standup and had been to the Thursday night shows at Dr. Grins, aware of the open mic night they held. I thought, “some of those comics aren’t funny but they have the confidence to get up and say what’s on their mind in front of complete strangers. If I could do that, it would likely solve my fears.” I sent an email to the Dr. Grins website asking how to get on their open mic and got an instant reply with a December 20th date to perform. I panicked and asked Stu McCallister, the MC who sent me the email reply, how to prepare for his open mic. He told me, “practice”, and referred me to the Riverfront Hotel. This brings me to the Halloween night where I got on for the first time. I did my 5 minutes and went home feeling relief. I had done it and lived through the experience. I got an email the next day from Stu, saying he was there in the back and saw me perform. He gave me feedback, told me to keep trying, and that he’d see me in December. I have been doing it ever since. RM: When did you first come up with the idea for your one woman show; and how much time elapsed between the first time you actually began to brainstorm concepts for the program and actually getting the venue in which you will be performing? NO: The one woman show came to mind in March 2015. I was thinking of how much resistance I get sometimes with some of my darker material. I thought, if crowds knew a bit about me, would they relax a little and let go of the tension? 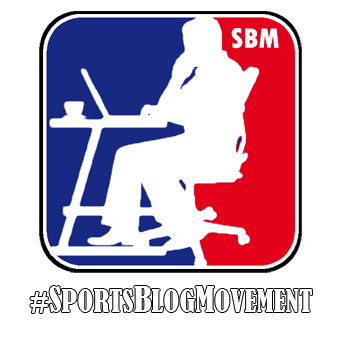 Is there an advantage to building a fan base, and do people enjoy you more if they trust you know what you are doing? Eight months passed between the first thought of the concept and booking the venue. RM: Now that you’ve written one, what do you think is the biggest difference between preparing a one-woman show and a stand-up set of great length? Since it’s just you up there in both instances, is there any variance in the pressure you feel in each case? NO: The one woman show relies on one performer to entertain the audience. Having no real buffer (MC or feature) to warm the crowd, has made me obsessive with the editing part of my writing. I don’t have something/one else to offer if people lose interest in what I’m saying. I feel pressure that way. Preparing a set as a comic is different in that you’re organizing jokes that are proven over time and have worked well for you. The first act of my show has never been done before. The second act, which is standup, is tested material I’m comfortable doing already. RM: Aside from the aspect of giving you more options to explore storytelling in a comedic fashion, what fascinates you most about the one-woman show format? Was there any one performance in particular you saw that just blew you away and made you think this was something you really wanted to do? NO: I was drafting the set list for a feature set about a year ago, when I realized most of my jokes are based on real life. There were segments that could be organized chronologically from birth, to adulthood, to my role as a mother. Coupled with the recent wave of immigration stories that were impacting Africa and Europe, I posted some personal childhood memories on Facebook. Some people commented, saying I should write my story down some day. I was surprised to hear so much interest from friends. Stewart Huff is an inspiration. First, he’s very funny and original. But his gift as a comic includes his intelligence, honesty, and warmth as a human. Huff’s storytelling style blew me away when I saw him for the first time two years ago. I hosted when he headlined one week, and couldn’t get over how much every crowd loved him. People listened intently as he neared the end of his show and told one long, sad story for 5-10 minutes. They stood and cheered when he walked off the stage. I felt as if he was doing something different than most comics and wanted to be influenced by it. I also watched Billy Crystal’s one man show called “700 Sundays”. It’s a two hour Broadway performance Showtime produced for TV and it held my interest the entire time. I made my husband watch it, and he loved it too. RM: What was the most important thing that you learned about yourself while you were developing the arrangement for the material in this show? NO: This isn’t about myself, so to speak but it’s the first thing I came up with. I learned I have incredible friends in my life. I was very shy and insecure when first sharing my idea. I told two comic friends to begin with. I expected some half-hearted response that it could be good, but they said “you have to do this”. I had no script at the time. I had a concept and friends who were giving me confidence and support to explore this. I held two meetings and invited people over to share different drafts of my story as it developed. I expected no one would come. Many came and sat in my living room, listening and giving me critiques. I couldn’t believe they would give up their night to be with me, and support me with my project. Comedians are a close knit group and friendships you make at night, on stage can run deep. RM: Is it considered politically incorrect for me to find irony in the fact that a show about African heritage is taking place at a location on Wealthy Street? What do you consider to be off limits as far as the skewering of African culture; and how does that differ from jokes on that subject matter that are just plain hack? NO: It’s not politically incorrect of you to notice the theater where I’m performing is located on Wealthy Street. The street was named for by one of the city’s founders, a business man named Jefferson Morris. He was a widower whose second wife was named Wealthy Davis. I don’t believe anything is off topic for a joke, as long as it’s funny. RM: I saw an interview you did with Alan Headbloom on a program called “Feel like you belong” where you talked about how you would go to open mics at Dr. Grins back in the day, and you noticed that some of the people performing weren’t that good but you respected them for putting themselves out in the open like that…Initially, how much of your interest in doing stand-up was based on the desire to earn that type of respect from a group of people who would eventually become your peers, and how much was due to a genuine interest in comedy as an art form? Do you feel that what you hope to get out of comedy has changed drastically in the time that’s passed since you first got on stage? NO: The only goal I wanted to meet initially was being more comfortable in front of strangers. I committed to one year of open mics to overcome the fear of public speaking. I didn’t expect to improve over time and enjoy it so much. I have always loved standup, but had a very surface love and knowledge of it. Jerry Seinfeld’s “I’m telling you for the last time” was the only CD I owned and got as a gift in college. I did not imagine I could be a comic though I knew I had a sardonic point of view. I have always dreamed of being a writer though. That is one thing I gave up in college, but have found again through stand-up. RM: In that same interview, you mentioned that you would define “belonging” as a certain degree of comfort level…When did you first feel like you “belonged” as a part of the comedy community; and was there ever a point where you felt as if you weren’t going to fit in with those groups of people or that you had misjudged the lifestyle typically associated with that of a comic? NO: I fit into the local community gradually. As an introvert, I have a hard time with small talk. My favorite line from The Simpsons is when Ralph tries to talk to Lisa and says, “So, do you like stuff?” I would keep to myself at open mics, until Stu McCallister invited me to hang in the back with the comics (via email because I was too scared to talk to him). The comics were instantly supportive and hilarious, took me in as one of their own. They would invite me go to open mics in cities like Lansing, Detroit, and Kalamazoo. This helped get me on the road sooner than I was comfortable with on my own. It opened my eyes to the amount of talent that exists in our state. RM: How would you best describe the support you’ve gotten for this project not only from those in the Michigan comedy scene, but from your husband and your children as well? NO: I answered part of this in the question about what I’ve learned (friends). My husband, Steve, has been incredibly supportive. He came to my first open mic and was so nervous for me. Before they called my name to the stage, he said “I think I’m gonna throw up”. He gave me a lot of constructive feedback early on, which helped me improve my jokes. He was on board with my initial goal to get stage time for one year. It wasn’t always easy, because he was home alone with the kids as a result. He listened to me develop the idea of my show Halfrican. Steve has a very logical, analytical mind so hearing the concept at first didn’t resonate with him. But he still gave me input when I asked for it. My kids have gone from skeptics to believers. They were five when I started and missed me dearly when I would leave for shows. I’m sure to them it felt like they were being robbed of my time and attention which they already shared with other things I had to do. One day, we were at a local bakery when a man approached me and said, “Are you a comic?” When I said yes, he called his wife over and we had a brief conversation about how much they enjoyed me at a recent show. It surprised my kids to realize I was really telling jokes and it was something people liked. Balancing it all was only made possible through my husband and support from his parents who watched the kids when I drove to shows. RM: As a nursing supervisor, have you ever had any interactions with individuals who have noticed you from your stand-up? If we were to ask your co-workers to summarize your day-to-day humor, what do you think they would say; and what percentage of the people you work with have seen you perform live? NO: I think 5% of the people I work with have seen me perform. Coworkers would say my working relationship is professional, but sometimes playful. I think it’s important to keep the worlds divided so that no one confuses your focus or dedication to your career as a professional. Yes, I’ve met coworkers at shows and am not surprised by their attendance anymore. Grand Rapids is a small town and Dr. Grins is the city’s comedy club where I host a few times each year. You run into friends and colleagues there every once in a while and need to prepare for it. RM: I have this theory that one of the reasons for gender inequality in your industry is the need for some to use the term “comedienne” to describe someone who is funny on a professional level, but just happens to be a woman…Is it possible I could be onto something there; and do you ever refer to yourself using that piece of nomenclature? NO: I don’t refer to myself as a comedienne. I first described my show ‘Halfrican’ as a one man show, until my comic friends said “one woman”. I thought, but I’m a hu-man, this is semantics. For me, it’s more efficient to say one man versus one woman when you read the description or flyer. Jobs in general have a title for role description and clarity. You fill a hospital with doctors, nurses, and pharmacists, for example. You don’t see gender or race in corporate human resources. RM: If you had to put a time frame on it, how far are we away from hearing a Nardos Osterhart comedy album? When it comes to setting goals for yourself, do you think about things in terms of “career checkpoints” or have you found that it’s better to let the chips fall where they may and the material will come from the things you experience in the process? NO: I think I’m years from a comedy album. I think goal setting is good and it helps you grow. I’d like to perform my one woman show in cities throughout Michigan. I see that as a great ambition and would feel proud to accomplish doing it a few times over the year in 2016. RM: Where do you go from here once the show is done? Do you have anything else of this scale planned for the remainder of 2016 and beyond? NO: I’d like to continue with my standup and keep writing new material. Getting into a festival this year is another goal.